Red Vinyl on 180 gram - 400 copies - download code. By combining found noises and field-recorded nature with minimal fragile surfer-tone post-rock-guitars, drones and fuzzy low-end bass-lines, Melanchoholics create mad extensive soundscapes and almost cinematic soundtracks to psychotic euphoria and intoxicated wastelands. After releasing on Drone Records, MNDR and deafborn, Solar Café is their final low-end manifesto for low-end connoisseurs. "[...] This really came out of left field and Solar Cafe is a wonderful surprise to say the least. [...]"
"[...]‘Solar Café’ evokes an effortlessly bleak and melancholic yet occasionally beautiful atmosphere, which will clearly appeal to listeners of cinematic scoped dark ambient and abstract guitar based music." MELANCHOHOLICS are a three-piece band, consisting of minimal guitars, low-end bass and lo-fi electronica. The only consensus was to create slow, impressive soundscapes. Their sound-mix rounds up with object recordings and processed field recordings. In this changing mix of sound sources used, the guitars remain as an constant element. The journey started 2001, three years after guitarist Benedikt and bassist Philip met by coincidence on a bus trip. The Band was founded in Dusseldorf, homebase of electronic-experimentalist Lutz. First Gigs were played in 2002. 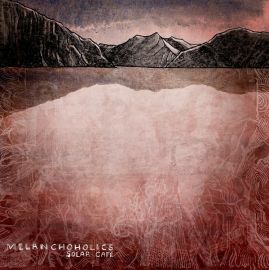 The debut album "Melanchoholics" came out in 2003. The album was defining the foundations of Melanchoholics' sound: a low-end manifesto for low-end connoisseurs. The band also did several colabrations with different video artists and filmmakers, such as Francis T. (CAN; 2002) and Emanuel Strixner (GER, 2006) "Single Act of Carelessness", released on 6th. June 2006 (6:6:6) on Multinational Desaster Records lifted the music to another even more experimental and minimalistic stage. The first vinyl release by MELANCHOHOLICS "Masking My Monkeys" was released via the high profile Drone Records label in December 2009.